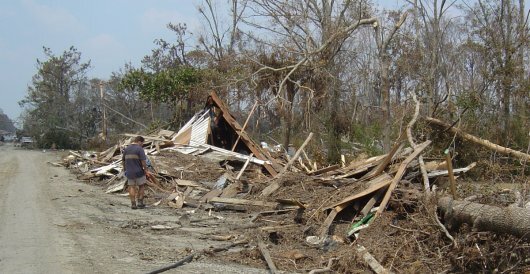 On August 29, 2005 Hurricane Katrina slammed into the gulf coast leaving nothing but devastation in her wake. 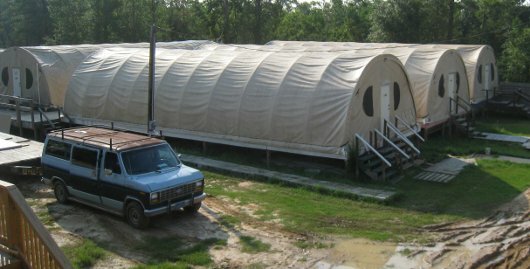 The Lakeshore Baptist Church buildings, situated about 1 mile from the beach on the Mississippi gulf coast, numbered in the casualties of the storm along with nearly 11,000 residences in Hancock County, schools, businesses, police stations – just about everything. Shortly after the storm, folks asked us if Hurricane Katrina destroyed our church. We firmly answered, “no.” While the storm destroyed all our church buildings, the church, itself, remained strong. The members of Lakeshore Baptist Church, as the hands and feet of Jesus, began using temporary buildings and ministering to our storm ravaged community. As a testimony to God’s sustaining grace, we have partnered with over 500 churches from across the country to rebuild our community. Through these efforts literally thousands of families in our county have received assistance by way of emergency food, clothing and relief supplies. Others have received donations of household items, including furniture, cookware, and even toys for the kids. Hundreds of homes were gutted and cleaned by volunteers working through the ministry here. Over 100 homes have been rehabbed and 35 homes completely rebuilt from the ground up. God has been at work. We have seen so much accomplished, but the monumental job remains incomplete. we plan to continue these efforts for the foreseeable future. Shortly after the storm we realized it would take several long years of rebuilding before we would see signs of full recovery for our church and community. I must confess, I did not anticipate what God would do in our hearts in the process. In the past four years God has shown us what a Gospel driven missional church can accomplish when she hungers after the glory of God and the good of her community. God has refocused our vision, reorganized our ministry, and re energized our passion. 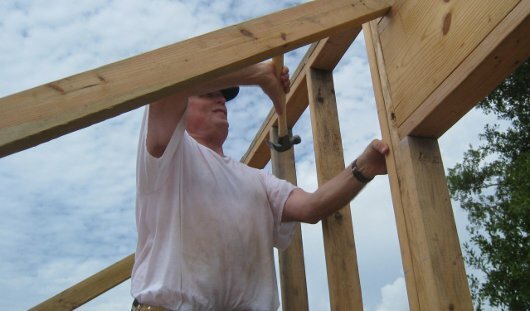 In many ways, Lakeshore Baptist Church stands stronger now than before Katrina. While we still maintain, “the church is not the building,” we recognize the value of facilities to fulfill our primary gospel mission. 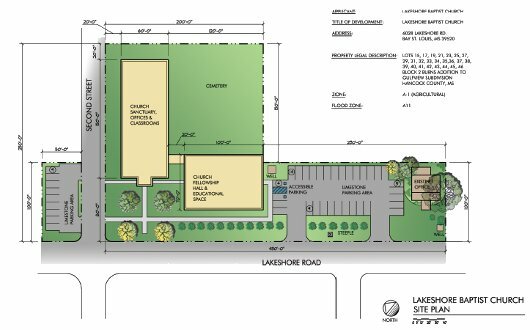 We have hammered out a master plan for the physical buildings that can facilitate our vision for the future ministry of the church in Lakeshore. Lord willing, I’ll post an outline of these proposed structures soon. Please continue to pray for us as we seek God’s greatest glory. This Saturday, August 29, marks the 4 year anniversary of Hurricane Katrina. The pictures in the video show the condition of the church property on the first day I was able to return to the area. We are down to the punch list on the church bunk house. Since we do not have many volunteers scheduled for the next few weeks, let me post it here in case anyone would like to make a special trip down to finish some things up. Lay tile or transition strip where 2×4 is. I’ve probably overlooked a few items, but this is most of what we have left to do. I’m really excited about this building. It came out very nice. I believe it will serve the ministry well. btw, we also have similar punch lists for a few houses where the home owners are just about ready to move in. We still have plenty of work to do as we continue to minister the love of Christ to our community. Let us know if you would like to come. 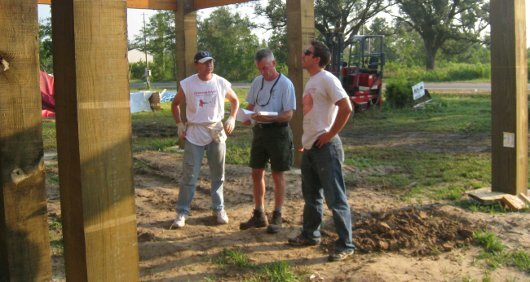 The house volunteers built for Shay and his sons has just a few small things before it is ready for final inspection. This home will replace the dilapidated flooded home that they have been living in since the storm. Because of the size of the lot and the condition of the old structure, it took some persuasion to get a permit last year. Sympathetic county officials allowed the Dahl’s to stay in the old house until the new house was complete on one condition; that we agreed to have the old house demolished within 30 days of receiving the certificate of occupancy for the new home. We need your help. We do not have anyone on the calendar next month equipped to tear down the old house. If you would like to make a special mission trip to Lakeshore to accomplish this task, just let us know. I do not know if it was the sweltering Mississippi heat or the non-stop buzz of activity, but the last few months seem to have blown by in a blur. Its hard for me to wrap my head around all that God accomplished through the Rebuild Lakeshore efforts in the last 90 days or so. 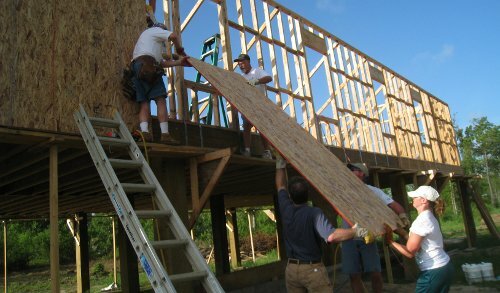 Teams from all across the country continued to flock to the gulf coast to lend a hand in the fourth summer of recovery. Our new bunk house sits almost ready to move in. The Mercy House awaits its roof. Several families are just a few steps away from moving into their new homes. Many more have been able to finally resumed their lives, All of this because of the hard work, generosity, and dedication of folks like you who partner with us for the glory of God and the spread of His fame. Please do not forget – the job is not over. When Hurricane Katrina blew Lakeshore Mississippi off the map on August 29, 2005, we knew it would take years before some semblance of normalcy would return to our community. We can’t slow down at this point. Families who still have not been able to get back on their feet run the risk of buckling under despair. I want to use this month to rededicate our efforts to stick in here for the long term as we minister help and hope in the name of Jesus Christ to our community. Our fall calendar of volunteers remains relatively open at this point. Please consider making plans for your next mission trip soon. Over the next few days, I will try to highlight some of the specific needs that still remain. A year ago this time, I hit a crisis of belief. I started looking at what the gospel teaches and the Word teaches about the poor. All throughout Scripture, God measures the integrity of his people’s faith by their concern for the poor. And he has strong words on this subject. I asked myself, Do I really believe the Word? I preach it, I love it, I memorize it, and I study it, but am I really willing to submit my life to it in such a way that I reorient how I live my life in Birmingham to have deep compassion for the poor? This process overflowed into my preaching. As we studied the Rich Young Ruler or Luke 16 and saw concern for the poor all over Scripture, I said, “We are ignoring the poor with the way we’re living in Birmingham. If we believe the gospel, then our opulent living compared to the rest of the world does not make sense. We need to make major changes, individually, in our families, with our houses, cars, and stuff.” People would not say they wanted to resist the Word, but that message created all sorts of stirring. That’s where the Word is attacking a core issue in our culture. I’m not advocating legalistic standards, but what we’ve seen in the Word is that if Christ is in us, then our lives do not make a lot of sense in this area. There are 16,000 children who will die today due to starvation or preventable disease. We need to answer for why we’re spending so much on our homes and stuff. My wife and I put our house on the market and began making adjustments. Others have been doing the same. One wealthy member in our faith family, while we were studying the Rich Young Ruler, told me I’m nuts. But then he said, “I think you’re right. This is exactly what the Word teaches.” With tears in his eyes, he said, “I have reached the conclusion that I’m never going to stand before God and hear him tell me, ‘I wish you had kept more for yourself. '” Now he’s selling his house to invest in needs around the world.